The leaves are actually solar panels. 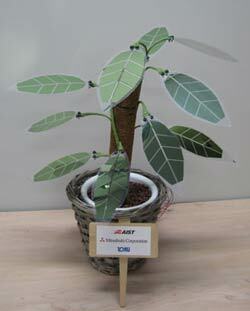 Despite the appearance in the photo above, the leaves are flexible as shown here.developed by Japan’s National Institute of Advanced Industrial Science and Technology, Mitsubishi, and Tokki Corp. I’ve said it many times before on this blog. Japan rocks.